I am a collector of memories. A moment curator. A true nostalgic. The type of person who should DEFINITELY be making baby scrapbooks for her kids. But I’m not. Not really. For as much as I cherish little moments and love to document the every day milestones that make up our lives, I’m honestly just not that crafty. I pretend to be sometimes. And my Pinterest boards will tell you a VERY different story. But realistically my creativity tends to flourish in electronic written form, not in scrapbook form. 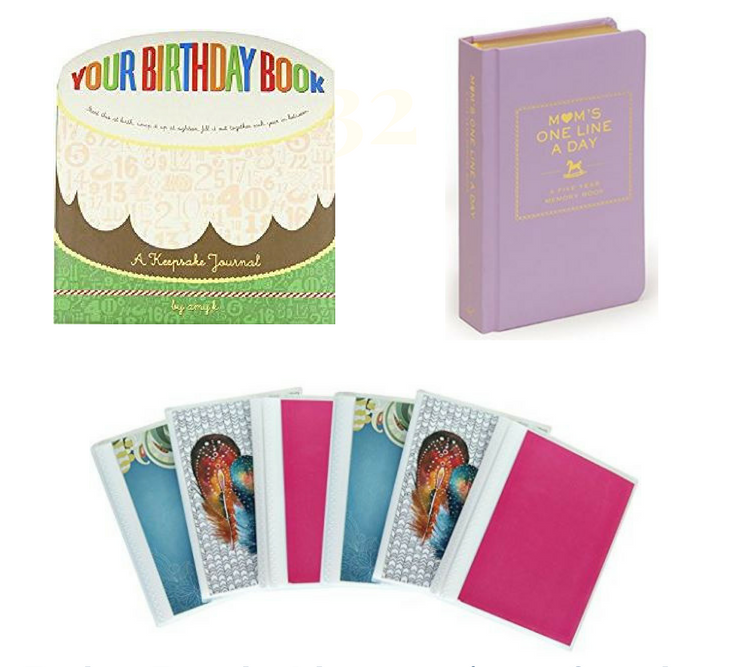 Okay, real talk, the Your Birthday Book: A Keepsake Journal does require tape. But very minimal tape. This book is very plug and play and requires a one time a year commitment to give highlights of your child’s birthdays for 18 years. There is a space in this birthday book to write about their birthday party, favorite toys, nicknames, and friends. And I’m guessing when you get to year 18, a fill in the blank scale for how clueless your kid currently thinks you are. Plus in scrapbooking for dummies fashion, a clearly outlined space to tape in a photo from each birthday. If I did actual baby books, this is where I would keep all the supplies for the baby book. Each of my kids has an oversized shoe box filled with photos, first footprints, hospital bracelets, deflated “It’s a Boy/Girl” balloons because my kids are TOTALLY going to want those, and a couple tiny outfits that I couldn’t part with. It’s like a DIY baby book box! A future craft project for my children! Parental laziness! The box that my kids will take one look at in 20 years and say “Cool, Ma…” TomAto, TomAHto. This one takes a little more time but in a super digital age, I like having something hard copy that gives some photo evidence that we did things that year. I’ve been making a photo book a year since before the kids were born, but post child birthing the books have gotten MUCH more adorable. Maybe not the easiest of easy baby books, but no glue required. 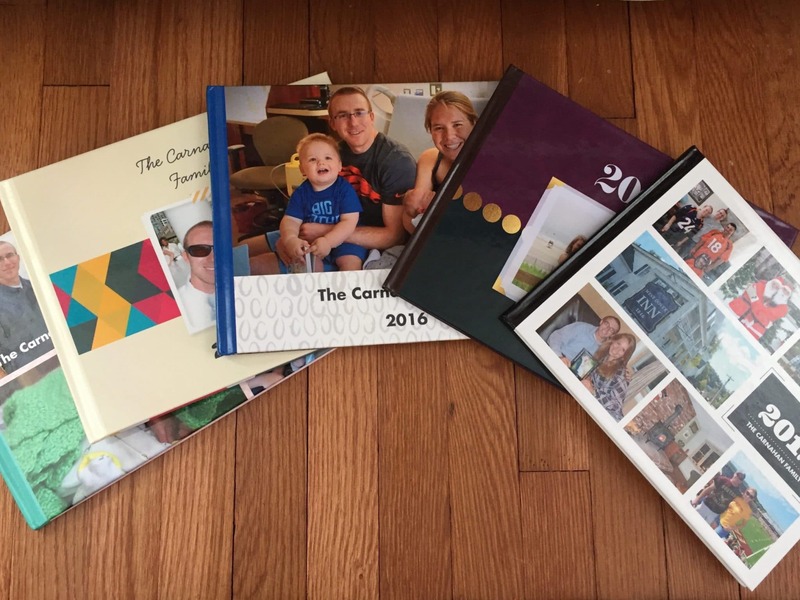 Use this link to get a free 8X8 photo book from Shutterfly! Why? Because Shutterfly is wonderful. Mini Photo Albums are my go-to Christmas stocking gift for the kids. Santa does the real heavy lifting on the stockings, but I try to pull my own weight by filling up a little plastic photo album for each kid that has pictures of them with their family and friends from the past year. Easy baby book – done and done! If you’re already using Shutterfly for photo books or calendars, download their app and you can upload pictures and then order prints for free. Just pay the shipping. (This is where I should disclose that I own stock in Shutterfly or that they paid me $4,500 to write this. But I don’t and they didn’t. I’m just a fan girl.) Or head over to your local CVS. If you live in my town tell Kim the CVS cashier that I said hello and that I’ll probably see her later today. She’ll definitely know who you’re talking about. 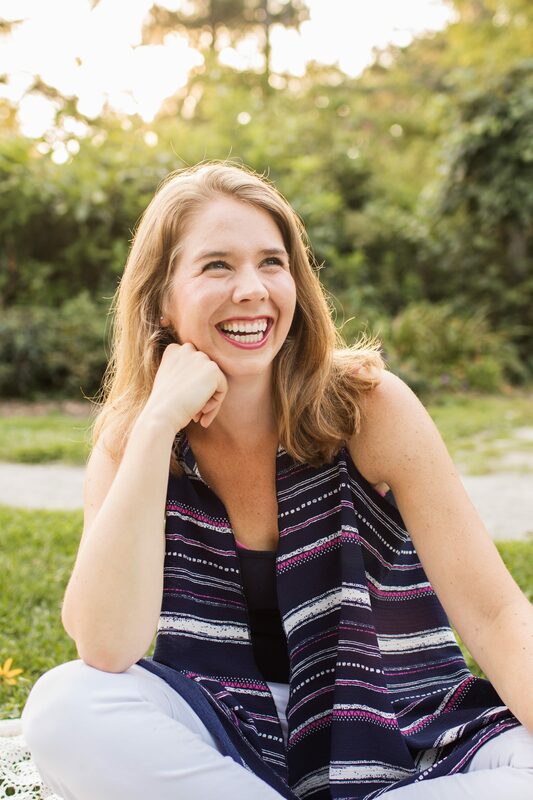 If you haven’t already read about my love affair with the one line a day journal, here’s a quick synopsis: It’s a five year memory book that gives you space on each page to write one line a day for five years. I include funny things the kids said, milestoney things, and doctor appointment stats so that I’ll have proof one day that my son really was 33 pounds on his first birthday. Sometimes I don’t write about the kids at all and instead talk about work, Girl Scout cookies, or my emotional reactions to This is Us. So it’s a mixed bag. Oh and usually I cram two to three lines in instead of one because I’m overly verbose. Shocking really. If you’re reading this and thinking, “This all sounds great, Bec. But I don’t really care for boxes, albums, handwriting, printing pictures, or privacy and would really like all of my memories to live on the internet for the world to see.” Great minds, my friend, great minds. So start a blog! Then send me the link, because I’m totally going to want to steal all your parenting ideas. I, too, am a non crafty, but pin it like I am mom. 1st baby book did ok. 2nd baby book… wait, is there a 2nd baby book…? Cute I like this! I haven’t had time to create all the baby books I wanted to. I am a scrapbooker but still love the Birthday Book idea! I also love the online photo books. I am a little obsessed with pictures! It’s totally scrapbooker friendly too! I enjoy the plug and playness of it, but I bet it could be nicely embellished. I made a baby book with all the ultrasound pics from our IVF (because there were like a thousand). So I have Keelan from when he was an egg through birth, lol. His real actual “baby book” has sporadic entries for the first year. Haha! Jack and Norah both have ultrasound photo books too because I was beside myself nervous while pregnant and those pictures were like oxygen for me. Once those kiddos come earthside though it suddenly seems like we have less time for documentation, who would have thought? I told my Grandmother-in-law (is that a thing?) that my son doesn’t have a baby book and I swear she looked at me like I had two heads. My daughter’s is barely filled out…. But they each have a box where I put all the “baby book” type stuff and I take a million pictures of them!